Treasure hunters will have lots more luck if they know where to look, and how to properly stake a claim on any bounty they find. 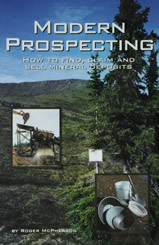 What is the right way to go about prospecting? This 6" x 9" paperback will tell you all about these things and much more in its 303 pages. Deposits: How Did They Get There?